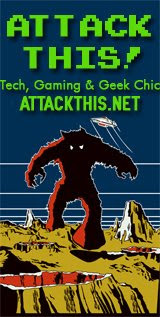 The Billionty-Oneth Geek: ATTACK WHAT? ATTACK THIS!!! My friends, Mike from Attack This! has recently invited me to be a guest contributor for his blog. As you can see from the picture above, Attack This! features all sorts of geekery; from the wide world of video games to the wacky world of cosplay, Attack This! has it covered. I've been asked to help out with movie reviews whenever I can. Fear not fellow geeks, I am not abandoning this ship. Every month I'm going to do a review or two on his site, but of course, my main focus is here. I'll put an update on my blog when I post a review on AT! just to keep you folks up on what's going on. But hey, you should check out their site anyways! Check out the post Mike wrote about me (here) and also, I wrote a bio for the page found (here). Stayed tuned friends! Fun on the way. That is so exciting, YAY! !